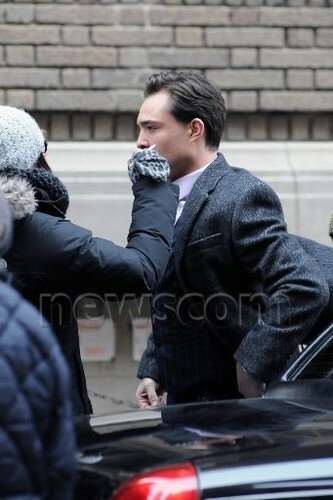 Gossip Girl Set - March 5, 2012. . Wallpaper and background images in the 에드 웨스트윅 club tagged: ed westwick 2012 gossip girl season 5 set photo. This 에드 웨스트윅 photo might contain 신사복, 비즈니스 정장, 거리, 도시 현장, 도시의 설정, 도시 장면, 도시 설정, 도시 거리, and 도시 장면 설정.